The Environmental Working Group (EWG) recently released a blog post titled “Thousands Of Schools Would be Close To Toxic Spray Zones.” The report basically states that if Enlist Duo herbicide is approved by the EPA, many school-aged children will be put at great risk. Enlist Duo is a new formulation of two well-characterized herbicides (2,4-D and glyphosate) currently under consideration by the EPA. If approved, Dow plans to sell the combination herbicide in conjunction with Enlist corn and soybean, biotech crops which are under consideration by the USDA. The EWG report has been picked up by several media outlets over the last month or so. Notably, nearly all of the media coverage uses the word “dousing” to describe applying the herbicide, so it is worth taking them with a grain of salt. The authors of the EWG analysis make no attempt to estimate how much of the herbicide we would actually expect children at these schools to be exposed to, they just assume that if schools are close to crop fields they are at increased risk of exposure. This is undoubtedly true, but if we really want to know if the children at these schools are actually at risk, we need to try and estimate the amount of herbicide the children will be exposed to. As an analogy, if you move closer to water the risk of drowning certainly increases; but if the amount of water you’re exposed to is less than a raindrop, the risk of drowning is still negligible. In this respect, the new EWG analysis is similar to their annual “dirty dozen” report, which simply lists fruits and vegetables that have been found to contain pesticide residues, ignoring the fact that the amounts detected are well below established safety guidelines. So I decided to look at some data to see if I could come up with an estimate of potential exposure for these schools near crop fields. A recent publication by Mueller et al. (2013) in Weed Science measured the concentration of dicamba herbicide in the air after spraying the herbicide. The first author of the study is a weed scientist at the University of Tennessee, and the other two authors work for Monsanto. I realize that this will immediately bring suspicion by some readers, but I would urge you to actually read the study and evaluate the science, not the authors. Mueller et al. did not look at 2,4-D, but rather at a related herbicide, dicamba. Dicamba has a similar mode of action as 2,4-D, and it was applied in the study at almost the same rate as we expect the new Enlist Duo 2,4-D formulation to be applied to Enlist crops. So even though there are some differences, the numbers in this study should be relevant to estimating 2,4-D air concentrations. If anything, the estimates in the Mueller study will overestimate air concentrations, since the dicamba formulations used in the Mueller study are much more volatile than most 2,4-D formulations. So using these numbers should provide an overly cautious estimate. Another important note about the Mueller study is that they measured herbicide concentrations in the treated field, not at a school 200 feet away. So the concentrations they observed will again be much greater than we would expect to see at a school 200 feet away. The greatest concentration Mueller et al. measured in air during any measurement period was 224 nanograms per cubic meter. This concentration was observed within 12 hours after herbicide application. The concentration dropped off substantially after 12 hours. It is, therefore, unrealistic to think this concentration would be sustained for a very long period. But to be very conservative and err on the side of caution, let’s assume that this estimate of 224 nanograms per cubic meter of air is sustained for an entire 24 hour period. Now that we have an estimate for the amount of herbicide in the air, the next question is how much of that air could children breathe? I found an interesting article here that measured exactly how much children (and adults) breathe under various conditions. Children (like adults) breathe a lot more when they’re active. When playing, children breathe approximately 18 liters per minute, compared to less than 10 liters per minute when they’re sitting. Children breathe the most when they’re running, approximately 30 liters per minute. Let’s assume that an extremely active child could potentially breathe in 30 liters of air per minute for an entire day. Using this estimate, a child who runs continuously for 24 hours (unrealistic, yes, but again, caution) would breathe 43,200 liters of air during a 24 hour period. This is equal to 43.2 cubic meters (1 cubic meter = 1000 liters). Data from Holmes (1994), California Environmental Protection Agency. we calculate that the child could potentially inhale 9677 nanograms of herbicide during the 24 hour period. Again, this is an unrealistically high estimate; actual exposure of children to the herbicide would certainly be less than this. But we now have a number, albeit a very high one, for potential inhalation exposure of children: 9677 nanograms of herbicide over a 24 hour period. But to figure out risk, we need to know more than exposure potential; we can be exposed to very high concentrations of some chemicals (like nitrogen gas or water) with no problems at all because they are practically non-toxic. Conversely, we can be exposed to very low concentrations of other chemicals (like lead) and have significant chronic toxicity problems. Risk is a function of both exposure and toxicity. So what should we consider a “safe” level of 2,4-D exposure? So, let’s use this as our estimate of a “safe” chronic exposure level. Let’s say that the EPA lowers the no observable adverse effect level (NOAEL) to 7 mg/kg/day as suggested by the EWG. I’m not suggesting here that I agree with EWG, but again, I’m trying to use as much caution as possible in this estimate. Let’s divide the EWG proposed NOAEL by 100 (as is required by the FQPA), and then implement the additional 10-fold safety factor for children that the EWG says is necessary. That would mean that a 0.007 mg/kg/day intake would be considered “safe” using the new safety factor. So as long as children were exposed to less than this amount, we would expect no adverse effects. So a 20 kg child (44 lbs, a relatively small 5 year old) could, therefore, ‘safely’ be exposed 0.14 mg of 2,4-D per day. So, to put it all together, even if the 20 kg child ran around in the sprayed field continuously for 24 straight hours, they would only be exposed to a maximum of 0.0097 mg/day, 14 times less than what would be considered safe using EWG’s proposed standard. 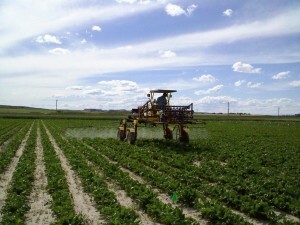 So even if we assume very high estimates of air concentration, assume very high breathing rates of children, assume a very small child, assume unrealistically high exposure time, and assume an unrealistically close proximity between the child and the treated area, there is nothing to indicate the children would be exposed to unsafe concentrations of the herbicide. If we use more realistic values for each step (proximity, concentrations, breathing rates), the chronic exposure would be almost negligible. 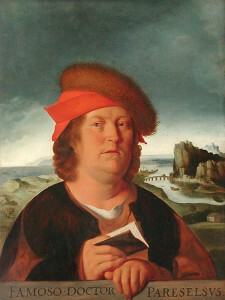 If Paracelsus were alive today, I have to think he would not be too concerned. Now, there are at least two caveats to the calculations above.The treated plot size in the Mueller study was only 15 m by 15 m, which may decrease the amount of herbicide detected in the air samples. However, using the peak concentration found in the study as an estimate of continuous air concentration should more than compensate for differences due to treated area size. Second, I’ve only addressed concentrations due to volatility; I did not include the potential impact of particle drift. But in terms of chronic toxicity, it is the continued exposure that is important. Certainly, there is potential for increased drift of the herbicide on the day of herbicide application, if wind is blowing from the field toward the school, and the applicator is not taking appropriate steps to minimize drift potential. But, realistically, this would occur a maximum of 3 times per year (on the day when applications are actually being made). I suppose it is plausible that 2,4-D exposure only 2 or 3 times per year over a several year period might cause health effects. But if that were the case, it seems that most golfers, homeowners, and athletes would have been impacted long ago; 2,4-D has dominated the home lawn, and commercial turf markets for decades. In addition, most Enlist Duo herbicide applications will be made during the summer, when schools are typically not in session. So the potential exposure of school children under real-world conditions, while certainly not zero, is pretty low. Ena Valikov makes a valid criticism in the comments about the NOEL level suggested by the EWG. The EWG estimate is for ingestion, not inhalation. So I did some searching for an inhalation level that is considered ‘safe’ for 2,4-D. The Occupational Safety and Health Administration (OSHA) lists several types of exposure limits. All of these safety limits (the NIOSH REL, OSHA PEL, and ACGIH-TLV are set at 10 mg per cubic meter. There are certainly plenty of deficiencies in the way these limits were established, but in general, air concentrations less than this are not expected to cause chronic health problems for workers. So the calculations above are actually even more conservative than what is currently allowed in the workplace. The highest concentration found by Mueller et al. in the sprayed field (224 nanograms per cubic meter) is 44,000 times lower than is currently allowed in the workplace using these standards.